We’re all used to how breaking news and issues are often heard on Twitter way before the actual on-line news channels. Global events like Arab Spring were fueled by it. Best wishes to footballer’s sent via it. And donations for unfortunate marathon runners raised by it. But there are still some thing’s to be discovered. They can be surprising. And very inspiring. One of those discoveries occurred over the recent Bank Holiday weekend – all thanks to a tweet by @LordPlumpton. 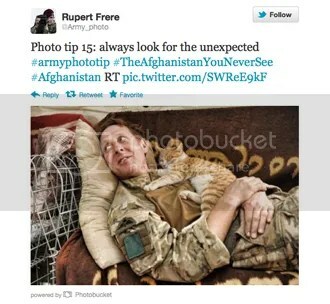 The inspiration that is: #TheAfghanistanyouneversee – it’s one hashtag you must follow. For most of us, the only images we see of that land are of bad news. Reports of another dead soldier. Or some other recent atrocity. 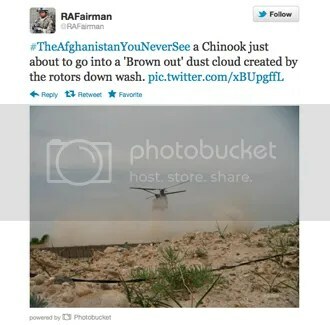 Now compare all of that to the reality of the images you’ll see on that hashtag. Many of them are beautiful photographs. All by serving armed forces personnel. Not all of them British. It gives you a real insight into the real life over there. For them and the Afghans. Not every hashtag makes it into the Top Trending Topics and then disappears forever. Some of them are all the better for it. This is one of them. Twitter jobfeeds. There’s the (occasional) good, the (often) bad and the (extremely) plain boring. Imagine the surprise when you see how Twitter’s very own jobfeed, @Jointheflock, does it. You’d be expecting something good. Now it’s not too long ago, the recruitment twittersphere went a little bit ga-ga over a certain ‘pastiche’ employer video by the same username. But can the same be said for this update? No chance. It’s exactly the same as the majority of jobfeeds. (Except many of those, at least, think to include a hashtag or two to boost their reach.) It’s extremely underwhelming. Now, we know that Twitter probably doesn’t have to try too hard to attract new recruits but shouldn’t you, at least, try to show your own ‘media’ to its best advantage? There’s nothing new about the world of social TV. With apps, such as Zeebox and Yap.tv – to act as your friendly sofa companions during your evening viewing. Then there’s the multitude of social media accounts for TV programmes, and channels – all to keep you involved and engaged via the odd hashtag or two. And, of course, there are the TV celeb accounts – the ultimate on-line PR of where and when they are appearing. But how about the star of a show actually tweeting, and Twitpicing, during live broadcasts? Direct from the talent show’s judges chair. Yep, that’s will.i.am during the The Voice UK. You’ll notice him on camera, using his phone for all to see. (Even though he was asked not to.) But it’s real. It’s part (or should be) of the reality format. And why not. It’s much more authentic than some psuedo-marketing tweets about the show to help keep viewers connected. His tweet above explains the reason why, so perfectly. You can’t argue with the fact. And hopefully, even though producers of The Voice may yet try to ban him due to some viewers have complaining that he’s being distracted from his ‘day job’ of mentoring and judging by his tweet activity, long may he continue.